RFID wallet reduces the risk of RFID identity thefts by blocking RFID readers from gaining access to your personal information and data. This is why RFID blocking wallets are becoming increasingly popular, not only among travelers, but also for everyday use. RFID is an automatic identification method, i.e. storing and remotely retrieving data using devices called RFID tags. RFID tags can be attached to products or living creatures (animals, people) for the purpose of identification. There are many benefits of using RFID tracking, e.g. to track lost or stolen products and pets. They can also save time, e.g. by automatically reading information (instead of having to enter them manually each time). RFID microchips can be found in many credit cards, bankcards, ID cards, and passports. The chip emits radio waves that can be downloaded without your knowledge. Hand held RFID readers are easily available on-line and can read your data from up to 10 ft. (3 meters) away. Your cards include information about your account number, name, issue date and expire date. While your passport includes information about your passport number, issue and expiry date, your name, date of birth, digital photograph, and biographic information. Identity thieves can access all those information if you carry cards or passport with RFID tags. How Do You Know If You Are At Risk Of RFID Identity Theft? You are at risk of RFID identity theft if you carry cards or passports with RFID tags. Bankcards with RFID tags are contactless payment method, i.e. you hold or wave the card in front of a reader instead of swiping it at a machine. RFID bankcards usually show series of wavy lines indicating radio waves on the front or back of the card. The same applies about e-passports, they have integrated computer chip allowing contactless reading of data. This symbol is usually printed on the cover of e-passports. What Is RFID Blocking Wallet? RFID wallet and bags use special RFID blocking material to block the radio wave transmissions and obstruct RFID readers from gaining access to your personal information and data. There are number of luggage manufacturers that specialize in RFID blocking wallets and accessories. Pacsafe is one of the leading travel security brands in the world. Pacsafe mission is to empower their customers to travel the world with confidence and peace of mind. Pacsafe offers high quality smart travel gear with built-in innovative anti-theft technology, including products made from their award winning RFID blocking material. 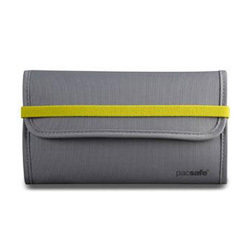 Pacsafe not only offers RFID blocking wallets, they also offer RFID bags and purses. Dopp offers range of luxurious leather wallets boasting modern RFID blocking technology. The style is traditionally male, making Dopp popular among male frequent travelers. 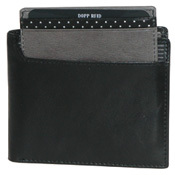 Dopp RFID blocking wallets include two and three fold wallets, breast pocket wallets, and business card wallets. Ogon RFID aluminum wallets are not only stylish and durable. They also come with RFID blocking technology and are water resistant. The RFID aluminum wallet from Ogon is an innovative wallet. It is small enough to fit in pockets but big enough for your essentials. The style and colors make Ogon aluminum wallets popular by men and women alike. Stewart Stand offers innovative wallets that are thin and lightweight alternative to traditional leather. Stewart Stand RFID blocking wallets are composed of specialized industrial woven stainless steel fabric, with high performance textiles that reinforces the spine. Architecturally inspired and like silk to the touch, Stewart Stand wallets are truly unique. Royce Leather offers good range of RFID blocking wallets, as well as RFID passport wallets. Their RFID wallets have a built in shield that blocks the radio frequencies. The functional and practical design makes Royce Leather RFID blocking wallets suitable for everyday use as well as exotic travels.